Description: Decorated in the fires of creativity, this Celtic Goddess of Creation gives birth to Universe, the energy swirls around her giving rise to All That Is. Her skin, translucent and ethereal, reveals that She is anatomically correct. Hidden amongst the Celtic spirals on her belly, you will find the entire female reproductive system, including ovaries, fallopian tubes, uterus, cervix, and birth canal. 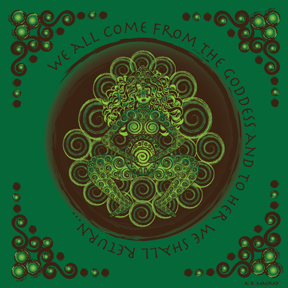 The text "We all come from the Goddess and to Her we shall return" is the first line from a popular Pagan chant.